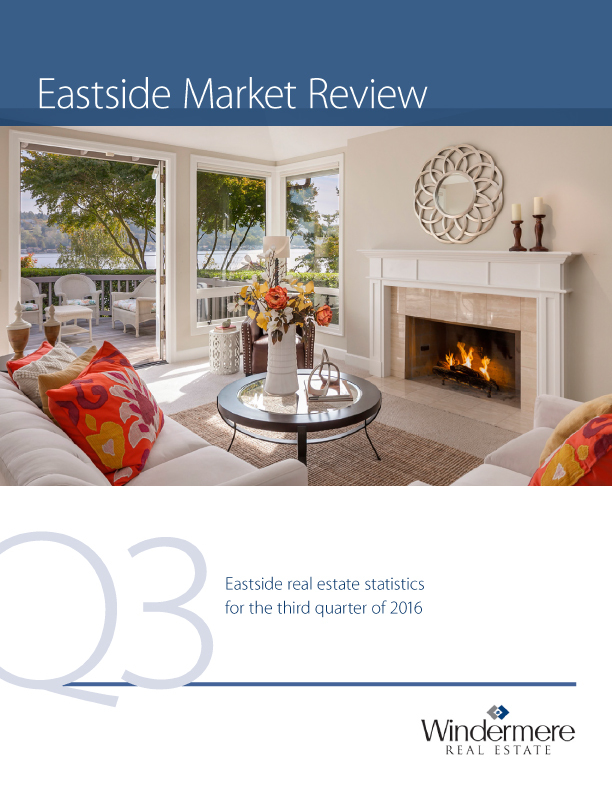 Here is Windermere’s very latest Eastside Market Review. I’m proud and excited that the cover photo shown below is of my gorgeous listing in the Summit. I will be holding this beauty open Sunday from 12 – 3. Come visit me! 15309 SE 58th Street, Bellevue $2,200,000. My fingers are crossed that the weather cooperates and our spectucular view is on display. I’m ready to downsize but don’t want to sell my home until I know where I’m going. Are you thinking about downsizing but don’t know how to make the tricky transition work? How do I buy a new place before I sell my current home? You are not alone and many of my clients feel the same way. They want to embrace a new lifestyle, take advantage of our ever-increasing values and lock in a smaller home or condo in an area that they covet. I help them do exactly that. Let me share some creative solutions that may help you make your dreams come true too. Everyone’s financial profile is different. One option might not work for you while another one will. It might even be a combination of a few of these. Windermere Bridge Loan – Windermere has a wonderful program for our clients to bridge the gap between buying and selling. You can borrow up to 65% of the equity in your home. The maximum loan is $500,000. I have recently helped several clients take advantage of this program. The approval process is fast and easy. Making a move, whether you are buying a larger home or downsizing out of your now empty nest, is a big decision. You’ll want the best professionals to help you. I can put you in touch with a lender who will help evaluate your financial situation and customize the best options for you. I’m here to help you with the real estate side. I have 28 years of results-driven experience to back you up. If you are considering downsizing to a new home and would like to talk about the process, please call or email me at (206) 718-5863 or june@windermere.com. Come visit my website at junegriffiths.com. Review walls and ceilings for small cracks. Repair these throughout. If there are larger cracks in the ceiling, walls, foundation, or driveway, these might be a sign of a problem that you may want to look at or fix before coming on the market. Check the paint in each room. If the rooms need to be freshened up, paint is one of the cheapest ways to have big impact. Wipe down all baseboards and trim. If there are scuffs, dents, or marks, if your trim has a wood look, you can touch up the stain and if they are painted and the scuffs won’t come off, you may need to touch up the paint. Make sure your ceiling is free of cobwebs and dust. In the kitchen, cabinets (both inside and the doors) need a cleaning. I encourage sellers to declutter while they are at it. Buyers will look inside the cabinets, so I recommend boxing up the extra dishes, Tupperware, and spices while you are cleaning and making the insides nice and neat. While you are in the kitchen, clean and tidy up the fridge. Again, less is more, so use up or toss all those extra salad dressing containers, mustard, and hot sauce packets. Give appliances a thorough cleaning including the inside of the stove, the stovetop, grease traps, vacuum the back of the fridge, etc. Remove all the papers and magnets that might be on the fridge. Kitchen counters seem to attract a lot of clutter. I recommend clearing everything off and only putting back a few things that you are going to need for the next 90 days and that aren’t visually distracting. For example, you might need a toaster and a coffee maker. As long as those look neat and in working order, they can stay. But don’t leave a can of coffee on the counter. That goes in a cabinet. The same type of cleaning you did in the kitchen cabinets need to be done in the bathroom. Clean out all drawers and cabinets and only replace what you need in the next 90 days. Remove everything from the bathroom counters except for soap or nicely-organized jars with Q-tips and cotton balls. Everything else should be stowed in cabinets neatly. Edit your shower collection of shampoos, conditioner, body soap, etc, to only one bottle of each and remove extra razors and scrub brushes. Edit your towels to a single color that enhances the bathroom décor and make sure all family members know how to hang up the towels properly after use. Check tile grout and replace if necessary. Do the same with the caulk. Clean out the shower and tub drains. Check all the light fixtures in the house to make sure they are working property and to replace all burned out bulbs. While you are doing that, check each light switch and clean the switchplates. You can also make sure that the plates for the outlets are in good working order. Service the furnace and water heater. If you live in a rural area, it might be a good idea to have the septic inspected as well, although rules in different areas may affect when exactly you want to do this. Usually I suggest that carpets get cleaned. If wood floors are scuffed up, they may need to be refinished. Clean all blinds and window treatments. Clean out the fireplace and have the chimney inspected. Stage a log or two in the fireplace if you like. Clean glass doors and remove excess materials from the hearth and mantel. Review your houseplant situation. Any that are barely hanging on should be removed or replaced. Wash all windows and outside doors and make sure they slide freely. You may want to replace all windows that have a broken seal. Analyze each room to make sure the function is clear. Any items that don’t support that function should be removed. For example, if in the master bedroom, there is workout equipment, a desk with piles of paperwork, and a dog crate, I would suggest removing the workout equipment, dog crate, and packaging up the paperwork. We want a nice, calm space. While you are analyzing each room, declutter as much as possible. That means removing extra artwork that is cluttering up the walls, removing family tchotchkes and photography, and removing collections of things. For example, if you have collections of plates, Star Trek memorabilia, bells, etc, I suggest packing those up so the buyers can picture themselves in your home. If you have kids, getting the house ready to sell can provide you with a great opportunity to go through their toys and clothes and get rid of things they have outgrown. Since toys can create a lot of clutter, give them a choice of perhaps 10 things they can keep while the home is on the market, and then make sure they know how to put those away when they are done playing. Is anything broken or in need of repair? Believe it or not, the cost to fix these items now may be less than the perceived value the buyer may put on disrepair when making an offer. If your dog has scratched up a door beyond repair, there are deck boards broken, or a kitchen door is missing a handle, get it fixed before the home goes on the market. We want the buyers to feel that your home is well-taken care of. If there is a challenge with odors in your home, you can possibly use room deodorants or disinfectant sprays (but beware that some buyers are sensitive to these so don’t overuse). There are also products out there specially-designed to handle pet odors and you may want to rent an ozone system if the smell cannot be otherwise overcome or identified. If the weather has done some damage to your home outside, repainting and caulking the seams is a good plan. Make sure the front door looks especially, clean, freshly painted if applicable, and inviting. Verify decks and railing are in good repair and are freshly stained and/or painted. Get the roof cleaned of moss and dust and make sure there are no issues that should be addressed before the home goes on the market. Remove webs and bird droppings from eaves. Pressure-wash all cement surfaces such as driveways and walkways. Prune plants and trees so there is at least six inches or more of space between the plant and the house. Prune or remove plants that are partially dead or don’t look great and make sure to deadhead all dead flowers. If your trees need work, such as removing dead branches, go ahead and get this taken care of. Determine if mulch (bark, rocks, etc) needs to be replaced and do so. Make sure all container plants and pots look fresh and organized neatly. Areas that are graveled may need a fresh coat of gravel. Wind up the hose neatly. Keep the grass trimmed neatly. If there are bare patches, cultivate some grass and keep it green. Apply the same decluttering principles to the deck and outdoor living spaces. If furniture and décor is mismatched, this will distract the buyer. Make sure outdoor furniture cushions are cleaned. Add a pop of color with outdoor pillows, freshly-potted plants, and hanging baskets. Make sure garage door opener works. Remove excess clutter from garage. Belongings should be neatly organized on racks or in cabinets wherever possible. Clean the garage. Keep the floor swept. Depending on what you have in the garage, some people will use a leaf blower to clean out dust that is sitting on belongings and in corners. If applicable, make sure crawl space under the house is clear of garbage, pests, etc. We may want to put down new plastic sheeting on the ground if needed. And of course, give your home a thorough cleaning! There may be additional custom items for your home that need to be added to this list. Although this may seem overwhelming, addressing each item will bring in more potential buyers. If you are ready for your custom plan, give me a call: (206) 718-5863 or email: june@windermere.com. Windermere recently hosted our Eastside Kick-off meeting for 2016 at the Hyatt Regency Bellevue. Matthew Gardner, Windermere’s Chief Economist and Skylar Olson, a Senior Economist with Zillow, presented their thoughts about our local economy and real estate market in an interesting panel discussion. This is a summary of their conversation. Are we in a housing bubble and are home prices going to drop? King, Snohomish and Pierce Counties can expect a modest appreciation of approximately 6% this year contrasted with last year’s rise of 9%. The Bellevue area appreciated around 10% last year. The last crash we experienced was caused by aggressive lending practices, which have been curtailed. Our current market is being driven by supply and demand. What’s the needle that can burst a bubble? Before it was the lending policies. Matthew is not concerned about the Seattle market being in a bubble. He is worried about the markets in San Francisco, Los Angeles, New York and Miami. We may be overly concentrating on Amazon and other companies. Diversification is important. We can expect wage growth over the next five years. A lot of our new jobs are higher paying jobs and that’s good for Seattle. Kids don’t have to live in their parent’s basements after graduation and can live on their own. Incomes are declining slightly without a college degree. We should see 4% wage growth in Seattle compared with 3% nationwide. Rest assured that the $15 minimum wage is coming to Bellevue sooner or later. They will go up and the 30 – year conventional rates may get up to 4.5 – 5%. Not a huge increase but anything above 4% has a psychological barrier. This rise in interest rates this year will not be enough to impact demand. Foreign buyers still see value for their money in our market and will continue to invest here. Millennials are renting for longer periods of time. They are not getting married and starting families as early as their predecessors. The search for a life partner is taking longer. Home ownership is not diminishing for two income families. For single people, it’s harder to save up for the down payment because rents are very high. They often need help from Mom and Dad for their downpayment. Student loans are at historic levels and that has some effect but higher rents are the bigger factor. Older Millennials are getting more stable and are getting there. Do they want to buy? YES! They feel that home ownership is the most astute financial investment they can make but are very concerned about qualifying. There is concern about finding something that they’d want to live in. They love townhomes in urban settings. We will see more urban pockets in residential areas. Land will still be in short supply. This is hugely problematic for our region and will continue to push prices up. We are not adding a lot of new homes. We need more density in the single-family neighborhoods and we need better mass transit. The high prices are creating huge bedroom communities like Marysville. The commutes can be hours long. Their financial security will smooth itself out. They feel investing here is an astute financial decision and will continue to buy here. They may slow down on their commercial investing but not on the residential side. Condominium growth continues to diminish largely due to construction defect laws. Developers can count on being sued by the homeowners after the seven-year timeline runs out. Why develop condos when you can build apartments, get out two years sooner and avoid being sued? Condos are very expensive to build so costs to buy are very high. On the morning of January 21st, 350 Windermere Eastside Realtors gathered at the Hyatt Regency Bellevue to hear straight from the source about the exciting big and new changes happening in Bellevue. Four dynamic speakers shared with us the latest information about the Lincoln Square Expansion, The Spring District Development, Sound Transit East Link Light Rail and the Economic Forecast from highly regarded analyst, Matthew Gardner. Jim Melby, President of Kemper Development, gave us an overview on the Lincoln Square Expansion Project. Remember where the old downtown Safeway used to be, just north of NE 4th Street on Bellevue Way? Be prepared for some amazing changes there. They are starting to develop 6,000,000 sq ft of connected office, retail, restaurants, hotel and residential apartments. Yes, you read that right – six million square feet. Kemper Development feels that synergy is created by having all these things connected. They are starting construction on a 2,000 car six-level parking garage with speed ramps to take you right to your floor. Jim didn’t tell us how much this huge garage will cost but revealed that it pencils out to $70,000/parking space. You can do the math. One Tower will have a 245 room boutique hotel designed around a theme for a lake house. 231 luxury residential apartments above the hotel will be available to rent and models will be open soon. The other tower will be a 710,000 sf office building with retail, dining and entertainment. 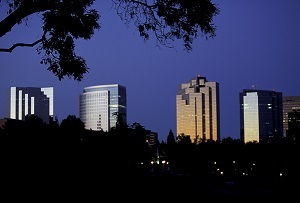 The City of Bellevue zoning allows for the tallest buildings in the city to be built between NE 4th Street and NE 8th. Bellevue Way is the western border of the high-rise zoning, which means that the tall buildings along Bellevue Way will have the best views in town. No one can build anything west of Bellevue Way to block these views and Kemper Development is taking advantage of this opportunity to build something amazing. A rooftop park with gorgeous outdoor amenities is planned and will be available to hotel guests, apartment dwellers and those working in the office building. Kemper Development is all about focusing on the Customer Experience. They are very excited about the seven-screen boutique theater with reserved seating and upscale food and beverage service. There will be an amazing dining experience with many new restaurants including one opened by a well-known local chef whose name has not yet been announced. The retail space is already 85% committed. The former JC Penney store in Bellevue Square in undergoing a transformation and will reopen in October with lots of new stores and restaurants. Snowflake Lane, Kemper Development’s gift to the community, is now one of the biggest Christmas events in the United States and cost $1,500,000 to produce this year. In the future, it will be even bigger, stretching along Bellevue Way all the way from NE 4th Street to NE 8th. Greg Johnson, President of Wright Runstad, talked with us about The Spring District Development, which is revitalizing an older warehouse/industrial district into something new and vibrant. The 36 acres, or 16 city blocks, is north of NE 12th and east of 120th NE running to 124th NE. Remember the old Safeway distribution center on 124th and Bel-Red Road? It’s been dismantled and much of those materials have been saved to be re-used. They are going green and sustainable all the way. Greg reports that the streets are in, the signs are up, and things are happening. Wright Runstad and their partners are making a $2.3 billion dollar investment to create 5.3 million square feet of office, multi-family housing, hotel and retail spaces with urban open spaces designed for living, working and playing in the same place. It’s designed more for people than for cars. The East Link Light Rail System will service The Spring District with stops at Whole Foods and the Spring District Stations and will offer service to Microsoft as well as Seattle and the airport. Housing will be more affordable than West Bellevue offers and the retail and restaurants will be less pricey, locally oriented and small in scale, appealing to a diverse population. Trinity Parker, in charge of Community Relations from Sound Transit, gave an interesting presentation on the East Link Light Rail System. In 2011, we spent 48 hours/year stuck in traffic and by 2035, that will increase 66 hours/year. She stressed that we need to invest in our infrastructure and transportation system. Sound Transit’s ultimate goal is to carry 100 million riders every year. Much of the planning has been done on the East Link Light Rail and construction will begin in the next year and escalate in 2016. She estimates a five-year construction timeframe with the system fully operational in 2023. They will operate three car trains, which will carry 200 riders and will run every 8-10 minutes. When we are finally riding the Light Rail from Seattle to Bellevue, the first station will be on Mercer Island on the I-90 median. Stop #2 – South Bellevue Park and Ride, which will have a significantly expanded parking garage. Stop #3 – Just south of the corner of 112th Ave SE and Main Street near Surrey Downs and the hotels on 112th. We will see some redevelopment of the hotels. Stop #4 – The trains will enter a tunnel and the next stop will be at the Bellevue Transit Station by City Hall. The station will be accessible from 110th Ave NE and 112th. Stop #5 – The train will head over I-405 and stop at a station behind Whole Foods. This will serve the hospital district and Wilburton area. Stop #6 – The 120th station will be underground and will service The Spring District. Stop #8 – Overlake Village Station along 520. This area has just been up-zoned and we can expect to see lots of development here. Stop #9 – Overlake Transit Station/Microsoft will be a huge transit hub. Microsoft is investing in a pedi/bike bridge that crosses over the station and will connect both sides of the Microsoft campus. There will be lots of redevelopment all around these stations. Sound Transit is working towards a 2016 ballot measure to further expand our light rail/transportation system. When asked where light rail is likely to go next, Trinity said that Sound Transit has the environmental work done to expand towards Redmond and that will probably be the next phase. After that, perhaps they will expand to Issaquah and Kirkland. Matthew Gardner, principal of the Gardner Group, is a well-respected Seattle economist and real estate expert who shared with us his vision for the State of the Seattle Real Estate Market and Economic Forecast. We are way up there for annual employment growth rates and that is an excellent indicator for the local economy. There are lots of local, national and global investments in our area and we are doing very well. We have very high paying jobs compared to many areas of the country. Our recovery is bifurcated which is a fancy word meaning it is divided. Retail and leisure are doing very well but our construction growth is behind. We have a lack of construction labor, which is holding us back. Many of those construction workers can make a lot more money fracking than they can make here in construction jobs. The unemployment rate in the US is 5.2% and in Seattle it’s in the low 4’s. 47,000 new jobs will be created in our area in 2015. The Space X and Facebook expansions will help our employment situation even more. It may not seem like it to us but Matthew argues that our housing is still relatively underpriced. This time last year he predicted that interest rates would rise in 2014. He stands by that prediction and estimates that mortgage rates will rise to 4.8% – 4.9% by December 2015. Even though he feels that our housing market is still underpriced, it’s still very difficult for first time homebuyers. They have difficulty putting together enough money for a down payment. Banks are still requiring very high FICO (credit) scores and the average score for a denied loan is 722. That is keeping a lot of first time buyers from fulfilling their home ownership dreams, which is a big problem. 75% say home ownership is important to them. This year our inventory will increase a little but not significantly. This will force sales prices to escalate moderately. Matthew expects to see 5% price appreciation in our area compared to 3.5% growth in the US. Last year, new home prices went up aggressively due to the high price of land and the low availability of lots. Expect to see a lot more townhome development rather than single-family homes. Most of the foreclosure issues have gone away and are not affecting our market. Bellevue is a vibrant city, is the 5th largest municipality in Washington and is leading the way towards making our region a very desirable place to live, work and play. Thank you to our Windermere Eastside owners for putting together this excellent presentation. They are always giving their brokers the tools to be educated about what is happening in our community so we can provide excellence to our clients. I am so proud to be affiliated with such a forward-thinking company. 1. New Electrical Switch Plates – This is such a minor, yet overlooked improvement. Most rental owners and re-habbers paint a unit and leave the old ugly switch plates. Even worse, some even paint over them. New switch plates cost about 50 cents each. You can replace the entire house with new switch plates for about $20. For the foyer, living room and other obvious area, spring for nice brass or nickel plates. They run about $5 each – not much for added class. 2. New or improved doors – Another overlooked, yet cheap replacement item is doors. If you have ugly brown doors, replace them with nice, white doors, (you can paint them, but unless you have a spray gun, it will take three coats by hand.) The basic hollow-core door is about $25. It comes pre-primed and pre-hung. For about $10 more, you can buy stylish six-panel doors. If you are doing a rehab, the extra $10 per door is well worth it. For rentals, consider at least changing the main floor doors. 4. Paint/Replace Trim – If the interior of the house does not need a paint job, consider painting the trim. New, modern, custom homes typically come with neutral colored walls and bright white trim. Use a semi-glass bright white on all the trim in your houses. 5. New Front Door – You only get one chance to make a first impression. A cheap front door makes a house look cheap. An old front door makes a house look old. If you have a nice heavy door, paint it a bold color using high gloss paint. If your front door is old, consider replacing it with a new, stylish door. For about $175, you can buy a very nice door. 6. The Foyer Entry – After the front door, your next first impression is the foyer area. Most rental property foyers are graced with very cheap floors. Consider a nice 12” tile. An 8’ x 8’ area should cost about $150 in materials. 7. New Shower Curtains – It amazes me that many landlords and sellers show properties with either no shower curtain or any ugly old shower curtain in the bathroom. Don’t be cheap – drop $50 and buy a nice new rod and fancy curtain. 8. Paint kitchen cabinets – Replacing kitchen cabinets is expensive but painting them is cheap. If you have old 1970’s style wooden cabinets in a lovely dark brown shade, paint them. Use a semi-glass white and finish them with colorful plastic knobs. No need to paint the insides of them (unless you own a spray gun), since you are only trying to make an impression. Americans spend 99% of their time in the kitchen (when they are not watching TV.) A fancy, modern faucet looks great in the kitchen. They can run as much as $200 but not to worry – most retailers (Home Depot, Lowes, etc.) often run clearance sales on overstocked and discontinued models. I have found nice Delta and Price Pfister faucets for about $60 on sale. 10. Add a Nice Mailbox – Everyone on the block has the same black mailbox. Stand out. For about $40, you can buy a nice colorful mailbox. For about $60 more, you can buy a nice wooden post for it. People notice these things…and they like them! When I show a home, I always want the kitchen to be inviting. Here are some ways to create a show-friendly kitchen. What are the top five ways to lose a buyer with this one room? The more “stuff” on the counters, the less counter space your room will appear to have. The more bits and pieces plastered on the front of the fridge, the more disorganized and cluttered the whole room will seem to be. The more “decorative” items you have strewn on the walls, the less your potential buyer will be able to imagine their own things on the walls. The idea is to make the buyer imagine living here. The less of you they see, the more of them they can project. Ii a matter of moments, a floor can become gritty. Add to that a few water spots in the sink, a slight coffee stain from this morning’s essential cup of coffee and a few crumbs perching on top of the toaster… and what do you get? A kitchen that seems dirty and uninviting. Be sure you take a look at your kitchen with fresh eyes. Stand at the door and pretend you have never seen it before. Imagine you are the grime police. Bring out the white glove. What do you see? Whatever it is, fix it. Now. Be so bold as to scrub the sink and shine it. Pay special attention to behind the faucet and the rim around the sink. Maybe use an old toothbrush. Sweep, mop and steam clean the floor. Thoroughly clean all appliances, even in the nooks and crannies. Make it simply spotless. Avoid cooking strong smelling food when your house is on the market. Day-old fish, boiled cabbage, onions, etc., will turn off even the most interested buyer. Avoid “covering up smells with strong sprays, over-scented candles and products. Your favorite “gardenia” smell may send your potential buyer into sneezing fits and you’re not kidding anyone. They are going to wonder what you are covering up. Instead, consider leaving out a single appliance – a bread machine with the timer set to be mid-way through the baking process when the house is to be shown. How many people do you know who don’t like the smell of fresh bread? If your cabinets are brimming with “stuff” or goodness forbid, things tend to tumble out when you open them, you will need to remove all but the most essential items when the house is shown. Pack up all the extras in boxes and put them in storage. Eliminate your “junk drawer” and be sure that your plates, glasses, and bowls are close together and located near to where you will use them. Organize your pantry area and be sure all food items are neatly stacked and appropriately organized and are not located in various cabinets throughout the kitchen. Consolidate them into one general area. When you finish cleaning and packing away, make sure that what remains is neatly organized and that everything is located where you are most likely to use it. I guarantee people will look in your cabinets. They will try to determine from your use of the area if there is enough storage space. If you can’t live in the space, why would they believe that they can? If you can’t keep it organized, how will they? Dark colors in the kitchen make it less inviting. It makes it harder to cook when you have to strain to see what you are doing. Ample light is a must and natural light is best. If your kitchen doesn’t have quality lighting, you need to add it. Consider “natural light” light bulbs and additional light sources under upper cabinets and make the room brim with warm, bright light. If your lights flicker or are dull, replace them. In one kitchen I’ve seen, there was no window to the outside but the owner had added a mirror with “window panel” framing over the sink and a light above it to add light, reflect it and give the impression of a window. It wasn’t perfect, but it was a vast improvement over facing a solid wall while doing dishes. Claustrophobic decorating would include oversized decorative items in a small kitchen, anything that requires you to dodge, move or step around to do simple tasks. Heavy, low-hanging items that “close in” the space in a kitchen are also ill advised. I recently saw a wrought –iron pan rack that was hung too low over an island in the center of the kitchen. It was covered in pans and it created a visual wall in the center of this modest-sized kitchen. The cook continually had to “bend down” to talk to people on the other side of the rack. This type of decorating was too “claustrophobic” for that space. Replacing the rack with higher-hung lighting would have eliminated the “squeeze” effect and would have lightened, brightened, and expanded the entire room. What do most people want in a kitchen? They want enough counter space to work and a clean line of sight, so kill the doo-dads and tuck away the cabinet-top appliances. They seek cheerful, well-lit areas and a clean, clean kitchen. People looking at today’s kitchen want to see a space that is inviting and easy-care. They want a kitchen that make them want to eat in, gives them a place to nest and adds comfort and relaxation to their lives. If you ask most people about the ins-and-outs of selling a home, chances are you’ll get a few diverse opinions. People who may have bought or sold only once love to give advice, this often does nothing but generate myths about the process. Myth #1: The longer a home is on the market, the higher chance it will sell. This is simply not true. In fact, the truth is just the opposite. The longer a home lingers on the market, the more likely it is to raise a red flag in the minds of potential buyers. The fix for a lingering listing is systematic price reductions. If potential buyers can see that the seller has been steadily dropping the price, then they will assume that the house was overpriced when it was first listed. This explains the long market time. Also, they will come to the conclusion that since the price has steadily decreased, the seller is reasonable and is truly interested in selling their home at market value. Myth #2: Condition and amenities matter more than price. Surprisingly enough, this is also a common misconception. When it comes to selling, the right price is truly essential. This does not mean that conditions and amenities are irrelevant, though. They can make the difference between one buyer loving or hating your house; however, price is a much more important factor for most buyers and is what gets the buyer’s attention. This could not be further from the truth. While the MLS is a powerful tool and gets your home in front of a large number of people, simply being the on the MLS doesn’t get your home sold in today’s market. These three factors make all the difference in determining pricing, generating buzz for your home, and getting an offer on the table. A good real estate agent can actually create opportunities for you by encouraging a buyer’s agent to write an offer. The MLS can’t do this by itself. And a good agent is looking out for your best interest. Getting an offer is only the beginning. Keeping a transaction together takes, skill, knowledge and a cool head when problems arise. With these myths in mind, stay clear of hearsay and advice from non-experts. Stick with the person who knows best what sells a home: your local real estate agent. That’s me! I am well connected in the community and can sell your home fast. Just give me a call at (206) 718-5863 or email me at june@windermere.com. Let’s get the ball rolling today.